He enjoys researching the ancient world with emphasis on the Mycenaeans and the Sea Peoples, Australian community cultures and their impact on Australian society. Currently researching material for two books, “An ordinary Bloke’ and “Pellana, the home of Helen of Troy”. Peter has written in excess of 500 articles on domestic and international issues and on controversial subjects that affect Australian society. Peter Adamis was born in Pellana, (a small village near Sparta Lakonia, the home of Helen of Troy) Greece on the 28 March 1950. His parents and young brother Philip migrated to Fremantle West Australia in 1954. In 1955, twins Kon and Helen were born in Perth. In 1956 the parents Vasili and Kaliopi decided to relocate to Melbourne to maximise employment opportunities and create a stable family environment. He is an avid supporter of Pellana his place of birth by bringing attention to the ancient Ruins of the town and its connection to the Iliad and Ulysses. The home of Helen of Troy and her husband King Menelaus (Master of the War cry). Peter and his siblings grew up in a multicultural environment that included many displaced persons and refugees from the European theaters of war during WW2. The family lived in Windsor, Prahran from 1957 to 1971 enabling Peter to attend Prahran Primary, Toorak Central, Prahran Technical and Footscray Technical Colleges where completed an electrical apprenticeship. As an apprentice, he was fortunate not to have been on the Westgate Bridge when it collapsed in 1970. Had it not been for the foreman, John Baker changing the work schedules on that fateful day, Peter and John Baker would have suffered the same fate as the other workmen. It appeared that life had other things destined for him. In 1971, one week after completing his electrical apprenticeship, Peter, without his parent’s knowledge enlisted in the Australian Regular Army. As a member of the Australian Military Forces, Peter experienced life as an Infantry Soldier, Administrator, Careers Counsellor, Survivalist and Warrant Officer. He was also exposed to fighting natural disasters such as fires, floods, hurricanes and cyclones. As a soldier, he represented Australia in New Guinea, Singapore, Malaya, United Kingdom, the USA and Greece. 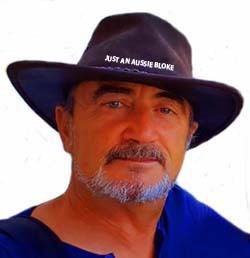 It is of interest to note that Peter is the only Australian of Greek heritage to have served in the Australian Defence Force in excess of 25 years’ service. In 1975, Peter married and had four children, David, Paul, Matthew and Mark. However in 1984, the marriage broke down as a result of service commitments amongst other matters and the children lived with their mother. In 1988, Peter was granted custody of his four sons; David, Paul, Matthew and Mark and took on the mantle of a single parent, raising the four children on his own. With four sons to raise and still a member of the Australian Defence Force, Peter’s commitment to both responsibilities did not waver and the experiences enabled him to have a greater understanding of children as a single parent. Peter served in the Australian Army in Australia and experienced overseas service in one capacity or another in places such as Malaya, Singapore, Papua New Guinea and a variety of other exotic locations. He believes that he has been blessed to have been trained and managed by the best men and women this nation has produced. As a result of that influence Peter has striven to excel in whatever life challenges came his way. This may explain his well-meaning attempts, with his heart on his sleeve in his endeavours to do what was right. His one fear in the Army was never letting his mates down. The research document was later utilised as a paper for the understanding of multicultural issues within the Australian Defence. Despite being a single parent, he managed to make time between his commitments to his children and Defence Force to become involved in the wider Victorian Community and pursue his interests in multicultural community affairs. His love of community based work led him to becoming an active member and Management Committee Councillor of the Melbourne based Lycurgus Hellenic Club, and member to the Pan-Lakonian Hellenic Club of Victoria. In 1990 on being re-posted to the Melbourne region, Peter joined a political party in order to contribute further to Australian society. His conservative right wing values and upbringing and military ethos naturally gravitated him towards joining the Liberal Party. Since that time Peter has held a number of positions and has contributed his skills and knowledge to successive generations. Peter now spends his time in passing on his political experiences to a new generation of Liberal conservatism. In 1991 Peter was asked by Bruce Ruxton, the President of the Victorian RSL to restructure the Hellenic RSL Club in South Melbourne and bring it into line with the Australian RSL Constitution, methodologies and administration. As a member and with the support of the Management Committee, the task was completed over a two year period. Peter continues to be a member of the Victorian RSL as a member at large and supports the Hellenic RSL as required. Peter was fortunate enough to have been selected for Telamon Force that represented Australia during the 50th Anniversary of the Battle for Greece and Crete. In 1993 Peter was invited to take on the role Secretary for the Whittlesea Australia Day Committee in which he played a leadership advisory role to the President and that of the Committee in recommending individuals and organisations for the Whittlesea Australia Day Awards. During this period, Peter was also invited to act as an advocate on behalf of a number Whittlesea Shire families over water rights that were becoming a problem with local developers. In 1994 Peter was invited to the Executive as an active member of the Australian Hellenic Memorial where in conjunction with the Australian Defence Force and the late Father Moutafis of St’s Anargiri Church in Oakleigh, was instrumental in raising thousands of dollars towards the memorial now located within the gardens of the Victorian Shrine of Remembrance. This was a great example of how two different cultures, Australian and Hellenic could work together to produce a great fund raising result. The monument that stands there today is a testament of multiculturalism at its best. In 1998, on discharge from the Australian Defence Force, Peter and his four sons settled in Watsonia to enable them to complete their education. Free of his military obligations, Peter was able to concentrate on developing his knowledge of community organisations, different cultures and their impact on the wider community. When the East Timor conflict erupted, Peter volunteered for overseas service but was turned down as too old for active service. Peter was first employed as a Traffic Operations supervisor, (Turnbull Fenner Pty Ltd), collecting statistics for the communities and Councils. In 2000 he was approached by the Greek Orthodox Archdiocese of Australia as a Training Operations Manager and employed within their welfare department (Employment Training Connection). This role enabled Peter to work closely with the youth, aged, disabled, unemployed members from various cultural backgrounds and he wider Victorian community. Further to this, Peter was involved providing humanitarian welfare work in the collection, distribution and provision food parcels and support to the elderly within the Hellenic and wider community. In 2003, on completion of his contract Peter was head hunted to take on a leadership role with an employment conglomerate (Skills Link West), consisting of three community organisations under the one administrative umbrella based in Broadmeadows and Glenroy. This role also enabled him to be closely involved with the underprivileged, unemployed, different cultural community groups and those with refugee status. Whilst a member of the organisation Peter fulfilled his lifelong ambition and completed a Bachelor of Adult Training and Development Degree at the University of Monash and Diploma in Training and Assessment Systems with an interest in Mature Age studies. In 2009 Peter completed his postgraduate studies in Occupational Environmental Health and Safety. In 2004, on the completion of his contract, Peter and his wife Yovanna created the consultancy firm named ABALINX, providing advice and support to community organisations on Career, Employment, Occupational Health and Safety, Mature Age Matters, Change Management and Training. His research on Mature Age studies and the barriers to employment for the Mature Age and Disabled have been published on his firm’s website and open to the public. The firm also catered to the youth seeking employment, material and IT support on a voluntary and unpaid basis. Suffice to say participants and volunteers found permanent employment within six. In 2005 during a visit to a client, Peter was invited to apply for the leadership role of the Business and Public Relations Manager with the Greek Community of Oakleigh and Districts. On being selected, Peter began to raise the profile of the community within Victoria, Australia and the world. In addition Peter has been directly active in supporting the Oakleigh Greek Community with its fund raising projects and programs in Welfare, Benevolent Society, Youth, Aged Centre, College, Community events and functions and the Church of Sts’ Anargiri. Peter has also been instrumental in raising much need funds for the College IT network system, Access lift to the Community centre for students, creating the websites and attracting sponsors to support the Community’s College interests. In 2007, Peter was instrumental in the invitation and Public Relations for the Prime Minister of Greece visiting the Oakleigh Greek Community. He has also coordinated events for foreign dignitaries and overseas visitors with the aim of obtaining their assistance as potential sponsors or to provide financial support to the community. In addition he has assisted many single parent families and the elderly to survive during difficult financial and stressful periods. Furthermore, he was also instrumental in assisting members of the community in obtaining employment and assisting them to remain employed. Peter feels that it is important that all community organisations, whether they have multicultural origins or not should become responsible in providing support to the young and elderly within their sphere of influence. Peter was also a past member of the Hellenic Business Forum. This organisation volunteer their services in raising funds for charities and providing awards to young and aspiring leaders within a multicultural environment. One could say that Peter has been serving and promoting diverse and multicultural awareness, social tolerance and cohesion whilst a member of the Australian Defence Force and during his involvement with communities in the Melbourne and Metropolitan areas for the past 35 years. Peter’s commitment, leadership and dedication to the community and its organisations within the multicultural sphere and the wider community are unquestionable. His devotion and commitment to furthering multicultural concepts and policies are known, but to only a few. Peter is reluctant to advertise his involvement and shuns the limelight, preferring to remain one of the guardians and a silent achiever behind the scenes to ensure community services are provided to community members as required. Never one to shun a challenge, Peter will always fight the good fight, he has a strong sense of justice and is determined never to give up where other have failed. Although Peter is a “baby Boomer” he prefers the title of “Late Bloomer” due to the fact he re-educated himself late in life after his family and Defence Force responsibilities came to fruition. He holds a Bachelor of Adult Learning & Development (Monash University), Grad Dip Occupational Health & Safety, (Monash), Dip. Training & Assessment, Dip Management, Dip Public Administration, and Dip Front line Management, Certificate Industrial Relations and Negotiation. Peter hopes to return to University for further studies in history and spend his time writing about his generation and about those within his environment. Peter is also well known for taking his family and parental responsibilities seriously and to heart and has been accused of having his heart on his sleeve. He is often misunderstood but never underestimated given that his methodologies are unorthodox and yet produce the desired results. Since 2007, Peter as a result of life experiences and challenges that he has faced was diagnosed with severe depression which eventually led to three heart attacks 2010 and 2012 and finally diagnosed with a lymphatic form of cancer. After six months of hospitalization at the Olivia Newton John (ONJ) Cancer and Well-being Centre – Austin Hospital, Peter is currently in remission and recovery stage with effect 2016. The journey has been a difficult one but with the overwhelming support from his wife, Yovanna, family, friends and colleagues, Peter has drawn upon his faith and inner strength to reach the remission stage. Today Peter does not leave the home that often and when he does it is to continue with his family responsibilities, Director of ABALINX Consultants, community, and political activities. In addition to his love of writing as a freelance journalism, commentator and writing, his strengths are in leadership, management, mentoring and training roles. His organisation Abalinx is dedicated to learning and the creation of new knowledge, with emphasis on Mature Age Training, monitoring Generational Changes, Careers, Occupational Environmental Health and Safety. Primary role in Research & Consultant in Organizational Management & Training, Risk Management and Environmental Occupational Health and Safety. Interests are within the parameters of domestic and international political spectrum. Peter along with a few selected friends provide mentorship and support to the youth and support others in need at no cost and without seeking acknowledgement. In addition to his freelance journalist projects, Peter has been focussing on his latest project, constructing a tribute to ANZACS and the GREEKS in his place of birth Pellana, Lakonia, Greece. He uses whatever spare time he has to travel to his place of birth in Greece to complete the project called ANZAC GARDENS. It is a five year plan in which he hopes with the support of friends and the local villagers to have it completed for public view and to highlight the importance of the village as the home of Helen of Troy and her husband Menelaus. He continues with his thirst for knowledge and developing his wide range of interests such as poetry, reading, mature age research, supporting ex-service personnel, writing, information technology, gardening, mentoring, travel and blogging and contributing to online social media via Academia, Facebook, LinkedIn, Twitter and similar programs. Peter is blessed to have many friends and supporters and many consider him truly a gem in the rough, a man who will always be there for you no matter the obstacles. Lovely interesting story of a real good bloke. However it doesn’t mention anything about the wonderful, clever, smart, talented, very intelligent, good looking and wonderful bloke from Perth Western Australia. Thanks cobber. I remember you well. Stay strong mate. Not many of us left. Hi Pete the Greek. I was in B Company 6 RAR in 1973. What fond memory’s you bring of our days during 1973, it is my intention to finish my days in Singapore once my wife passes. I must admit I negelected to appreciate our younger years, but i intend to die a contented human being. Hello Ron. Cobber I remember you well. I do hope you are well. Mate, do what is in your best interests, be happy, don’t stress out and enjoy life. I understand what you have written and each must do what makes them happy. Please send me photos of the past and present for old times sake. I keep a record of our younger days and of our generation.